Every now and then I like to make Yakisoba noodles. You can find them in most grocery stores in the refrigerated section, usually near the tofu and other vegetarian products. How convenient, since this recipe calls for tofu! 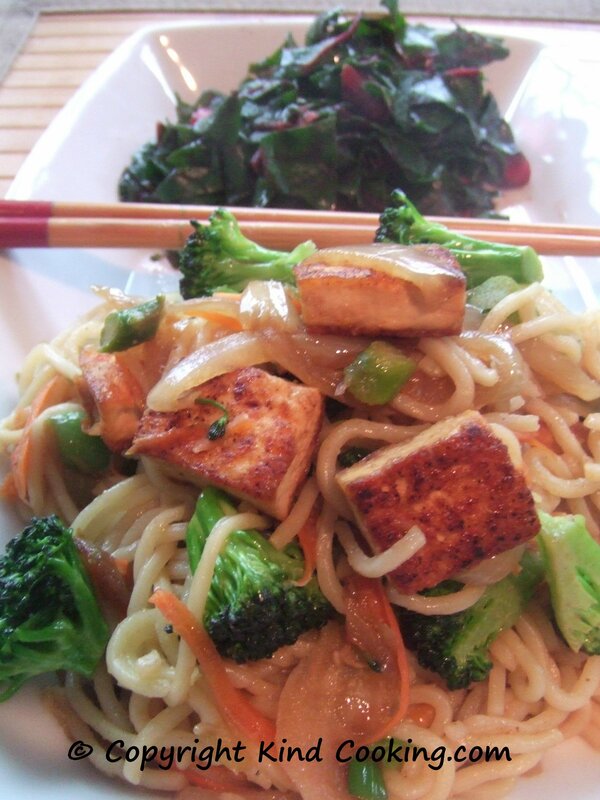 Stay away from the packaged sauce that often comes with dry yakisoba noodles! It is full of sodium and additives and don’t taste good! The best kind (quality, price & quantity) are the fresh noodles (usually 2-3 per pack). They are ideal for a quick meal, all you have to do is to briefly soak them in some warm or hot water for them to soften. You can also substitute soba noodles if you want wider noodles. 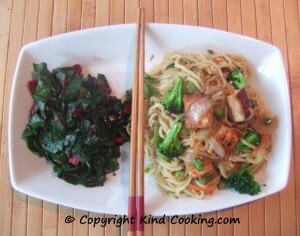 I had some beautiful Swiss chard so it was a perfect combination with the noodles. The whole thing took less than 15mn. Ok, so it took a little multi-tasking but it isn’t difficult. 1. Pour hot water in a large pot and place the noodles in it. Cover and leave for a few minutes. Stir the noodles and drain them. Discard the sauce package that comes with it. Way too much salt and sugar in it! 2. Rinse the tofu and pat dry in a clean towel. Cut in cubes. 3. Chop the onion, shred the carrots, separate the broccoli in small pieces and thinly slice the celery. Set aside. 4. Heat up some vegetable oil in a frying pan. 5. Pan fry the tofu, sprinkle with a little salt or soy sauce until golden. Set aside. 6. Pour a little of the sauce in the frying pan, add the onion until lightly tender. Add the celery, carrots and broccoli and a little more of the marinade if necessary. 7. Pour the noodles and the remaining marinade and quickly mix all the veggies. Taste, add more sea salt or soy sauce if needed. Remove from heat and cover. 8. Wash and rinse the Swiss chard. Roll the leaves and make thin slices. 9. Heat up 1 tsp of vegetable oil or a little water with some sea salt and quickly heat the chard until lightly tenderized. The goal is not to turn it into welted leaves but to just soften them. 10. 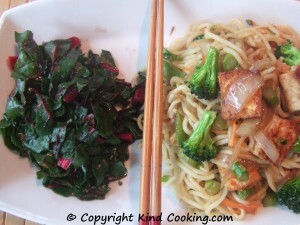 Place some of the chard on one side of the plate and the the noodles on the other.